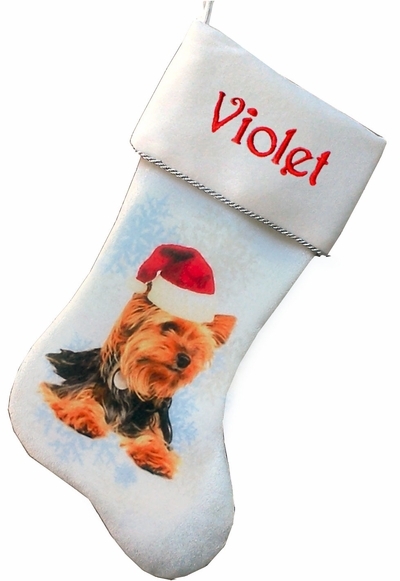 Personalized Yorkshire Terrier - Yorkie Christmas Stockings. This is 18.5" Velvet Christmas stocking with cute Yorkie Terrier picture in a Santa Hat ! Measured along the diagonal from the top left hand corner to the toe, the stocking measures 18.5 inches, and the width along the cuff is 7.5 inches. Materials: The stocking is made from white velvet velvets with silver bling metallic twist rope on the cuff for that Christmas BLING BLING effect! The inside lining is from soft white polyester satin material. The cuff is trimmed with silver rope to give the Christmas stocking that special luxurious effect. Lining: YES. This stocking is fully lined in polyester satin. Names can be personalized on the cuff of this Christmas stocking with metallic embroidery thread to compliment the colors of the stocking and the design on the stocking. We have a sample picture of the stocking monogrammed in metallic embroidery thread ... click on the thumbnail image in the top right hand corner of this page to see a larger version. For group orders of 2 or more stockings, we will do our best to adjust the font size of the letters so the monogrammed letters are uniform in size. Since the cuff of these stockings is narrower - we have about 4.5 inches width on the cuff to personalize your names. For example, if your order has the names Mom, Dad and Christopher, we will embroider the longest name first and then adjust the font size of the shorter names to match the font size of the longest name, otherwise the shorter names will appear to be disproportionately large. If you want the largest letters available monogrammed on the cuff, please specify SHORT versions of names, such as Mom/Dad/Chris instead of Mom/Dad/Christopher.